This law goes too far. 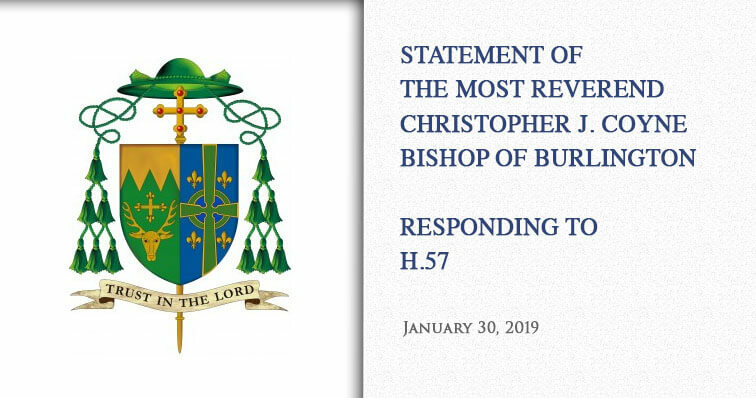 My brothers and sisters, I write today concerning H.57, a proposed state law that is currently working its way through the Vermont state legislature. You may have heard me say, “I am a pastor, not a politician,” so I am speaking to you as your pastor. You know that our faith teaches that all human life is sacred – meaning “of God” – from the moment of conception to the moment of natural death and that we are called to embrace and protect that sacred gift that is the very breath of each of our lives. You are also aware that the teaching and ministry of the Catholic Church “since the first century has affirmed the moral evil of every procured abortion. This teaching has not changed and remains unchangeable. Direct abortion, that is to say, abortion willed either as an end or a means, is gravely contrary to the moral law” (Catechism of the Catholic Church, 2271). As your bishop, pastor and brother I am fully aware of the division that exists within our society and even within the family of our Church around these matters. I know that when I stand before you as your brother and speak to you concerning the issue of abortion that there are many, even within our Church, who sadly hold contrary opinions based on a woman’s right to choose and the promotion of “reproductive freedom.” But, even if you hold such opinions and allow for a so-called “right to an abortion,” this proposed law goes too far. I plead with you, my friends. Do not let this happen. This law goes too far. Please contact your representatives in the Vermont legislature and let them know your feelings about this bill. You can find your representatives using the “Find a Legislator” tool. When calling, you will be asked to state your name and hometown along with your message, “As a Catholic, I oppose H.57 and unrestricted access to abortion at any stage of pregnancy.” Please also consider praying a rosary or other appropriate prayer for the protection of all life.